Understanding and applying gesture to your daily practice is a crucial step in your artistic development. 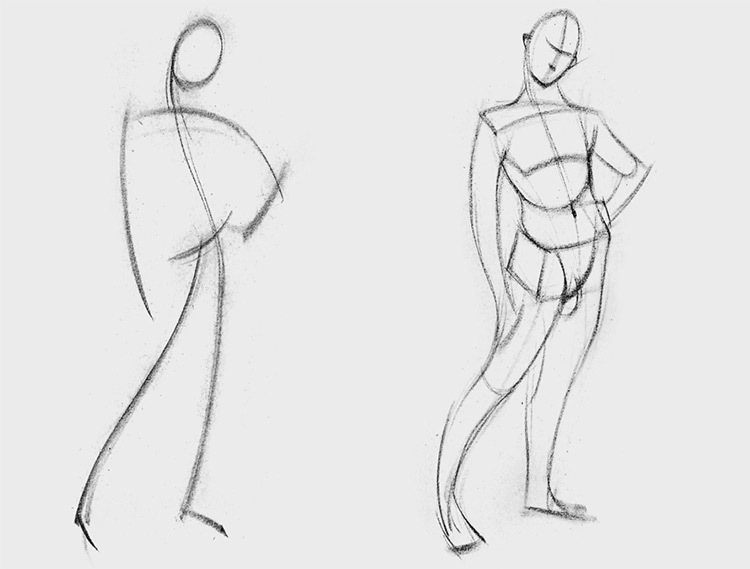 Gesture drawing is a method of capturing figures in exaggerated poses. Some gesture drawings lean more towards realistic representations while others exaggerate like crazy. The more you practice the more you learn to manipulate this technique. It’s a fundamental exercise that every artist should internalize and nail down. So what are the best techniques for improving your gesture drawing? I’d like to share a few tips in this post that align with Stan’s advice featured in his free gesture video. If you’re brand new to gesture I actually recommend Stan’s entire figure drawing fundamentals course. This is what I studied to learn gesture and it’s still a series that I refer back to from time to time. There are different goals to achieve with gesture drawing depending on what you’re practicing. You can do quick sketches of 30-60 seconds with a goal of quickly capturing the mood. Or you can work much longer with an eye for realism. Quick sketches are loose with very few lines. Your goal is to just get something down on the page. At first it’s gonna be bad. If you’re looking for tips the Hampton figure book has lots of great examples and suggestions to keep gestures loose but realistic. If you can power through the bad drawings you’ll eventually find your rhythm. You’ll learn to see exaggerations much easier and be able to push the motion of the body further than it looks in life or a photo reference. Ultimately the goal of all gesture is to study the figure and see how it moves. The human body is very complex and gesture attempts to simplify the body as much as possible. Everyone has their own methods for gesture drawing which makes it a very unique practice. The most wrong way to do gesture is to not do it at all. Depending on your goals there are some other rules to abide by. For example, if you’re going for a fully rendered drawing you want to examine the figure closely. You’ll always want to double check proportions but there is a point where you can be looking too much and not drawing enough. Gesture has a lot to do with feelings and emotions. Especially if you’re going for rough exaggerated poses. You want to conceptualize how the body is contorted to understand how it can be exaggerated. Where is the torso leaning? Which leg takes most of the weight? Ask yourself questions as you analyze each pose and draw based on your conclusions. There’s a decent WikiHow guide if you want to follow a step-by-step for some basics of gesture, although the free Proko video is much more comprehensive. If all your gestures look like stick figures then you might be drawing too tightly. Gesture is meant to capture movement and action. Every pose has some curve or direction that can be played upon, even if it’s very subtle. When you draw with straight lines you tend to lose these natural curves and the pose ends up looking stiff. Instead follow Stan’s advice and use lots of curves. Look for natural curves from the head to the torso, or from the pelvis to the feet. You can follow these lines with curves shaped like a C or an S.
However you can still end up with very stiff gestures and this technique won’t save you from that. But it’ll help you see the movement in every pose. You should be looking beyond the details to see which lines define each pose. Is there a large thrust in the hip to one side? Or is there a certain weight-bearing leg that deserves to be darker than the other? Just try stuff out and see how it looks. I’d like to add that straight lines are sometimes okay if they’re defined. A leg planted firmly on the ground may use a straight line segment to show the weight. But it could also curve up at the top near the knee, or curve down into the heel. These subtleties can make a world of difference. Since gesture drawings don’t take much time you have the freedom to experiment a lot. Use this to your advantage and be willing to try new stuff as much as possible. When you’re going for a realist approach to drawing there is a need for some copying. But this still requires an eye for values and proportions to get the drawing exactly right. Gesture is not meant to be a finished drawing. It’s just a practice exercise to train your eye and your ability to exaggerate. This means you shouldn’t always be looking to copy exactly what you see. There is good reason to mimic parts of the pose—especially for limbs to be in proportion with the rest of the body. But you should care more about how the gesture feels rather than how accurate it looks. If you can glance at a gesture drawing and immediately recognize how that human was posed then it’s doing its job. Everything you draw should consider the forms of the figure, but never become a slave to the figure. Understand that each part of the body is a form and has volume. Try to draw your gestures with this in mind. But don’t let the contour define how your gesture appears on the page. Be willing to break the contour as often as you like. Try to find a happy medium between pushing the pose but still remaining true to its original position. This will help you avoid direct copies that look boring and also keep you from exaggerating unrealistically. I was searching in Google and stumbled onto this review of Proko’s gesture drawing lesson. The author Angela brings up the importance of clean lines, which was also part of a Proko Q&A video. She wrote something that I think will resonate with many readers. When I allowed myself to be sloppy previously, I was attempting to ‘feel out’ the gesture by making lots of lines till I discovered the right one. This made me lazy and less observant of the form and pose I was trying to replicate. By simplifying my mark-making, I force myself to actually really look and learn from what I see, rather than diving in and rushing to finish. Sloppy lines will make it much harder to analyze your gesture. I said earlier that there aren’t too many rules, and this certainly isn’t a “rule” in gesture drawing. But if you can make every mark with confidence then your gestures will be easier to look at. If you take time to really analyze each figure you’ll get much better quality drawings every time. Your line work will be more guided and placed with a purpose. The best way to learn is by following Stan’s advice in his free gesture video. It’s a smaller version of the premium course but it should have enough info to guide anyone towards cleaner lines. All of this takes effort and commitment. You will not necessarily see direct improvements in your gesture work after a single day or even a week. It takes a while for this stuff to become ingrained into your muscle memory. But keep practicing and pay attention to your lines. Don’t keep re-drawing the same line multiple times trying to find where it fits best. Instead just make a line and try to get it right the first time. If it’s wrong then erase and try again, or simply move onto a new gesture. 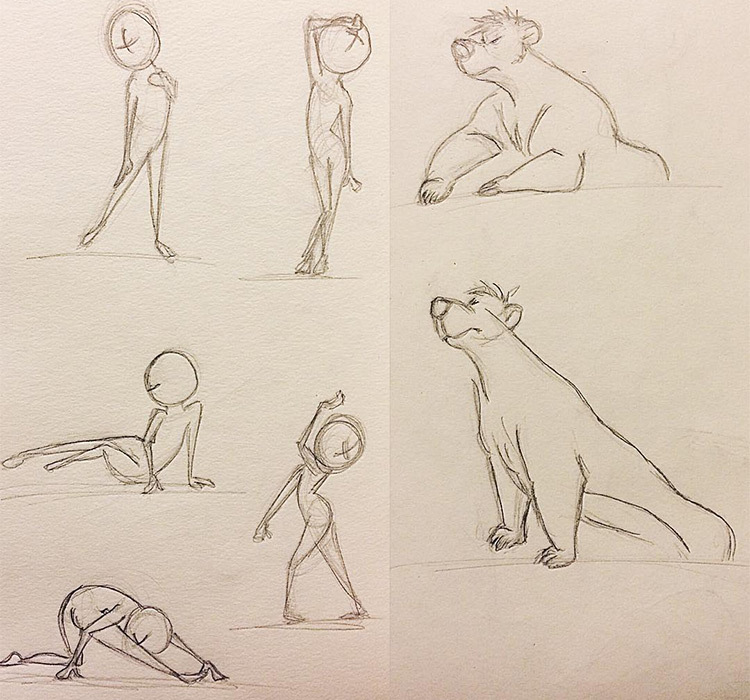 The more you practice seeing and understanding poses the easier it’ll be to copy them in one swipe of the pencil. If you already practice gesture then try applying these tips to your workflow. If you’re brand new then check out the Proko video and get started! Quick note: we also did a full review of the Proko figure series if you wanna read through that too. But these gesture drawings provide a great way to warm up for your day of practice. You can do 30-60 minutes of gesture and get a lot out of the experience. This is why Disney pays for life drawing classes for all their pro artists. A consistently recommended book for beginners is Figure Drawing for All It’s Worth by Andrew Loomis. He’s written dozens of books and this one is great for those just getting into gesture. There are many other figure drawing & gesture books out there providing great study materials. I don’t think they’re all worth grabbing, but here are a few solid recommendations. What is an Artist’s Visual Library?